Promoting healthier ageing amongst older adults has never been more important. Most conventional health promotion interventions for older adults take very reactive approaches, typically attempting to minimise specific age-related functional losses. This implies an underlining assumption that such age-related losses are inevitable. However, we know that it is possible to take proactive action to prevent or mitigate negative health events in later life before they occur. Research suggests that proactive coping and future investment strategies may work harmoniously with adaptive definitions of healthy ageing. However, this concept has not been tested as part of a proactive behavioural intervention for a broad perspective of healthy ageing. 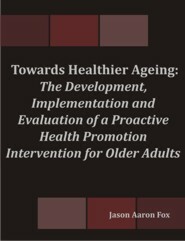 This research explored the implementation and controlled evaluation of a behavioural health promotion intervention that incorporated proactive coping strategies to facilitate healthier ageing amongst older adults. The intervention was built on a theoretical foundation combining constructs from the Health Belief Model, the Theories of Planned Behaviour and Reasoned action, and the Transtheoretical Model. A field pilot intervention was conducted to help shape the intervention content and to identify process limitations. The pilot intervention consisted of nine two-hour sessions held over consecutive weeks. Each session combined proactive coping workshops and facilitated goal setting with motivational presentations on topics pertinent to healthy ageing. Qualitative feedback was very positive, with 98% of post-intervention survey respondents (n = 43) indicating that their health behaviours had positively improved. The participants identified group interaction, a motivating facilitator, and goal setting as the key factors that influenced the efficacy of the intervention. The intervention and evaluation methodology was improved, and the main intervention was then delivered in three formats, based on the key influencing factors identified in the pilot evaluation. Each intervention used the same information base for five sessions held over consecutive weeks. A 2.5-hour workshop-based group intervention reflected the pilot intervention, featuring facilitated (group) interaction, motivating facilitator, and goal setting. A 1.5-hour lecture-based (group) intervention featured the motivating facilitator and goal setting, while a workbook-based (individual) intervention featured goal setting only. A spectrum of dependant variables related to healthy ageing was measured via surveys at pre-intervention, intervention conclusion, and post-intervention stages, using an explanatory mixed methodological approach. A focus group interview was conducted with each group eight weeks after the conclusion of the intervention. Results indicate that both group-based interventions achieved self-reported improvements (approaching significance) to health activities. The lecture-based interventions achieved significant improvements to memory and health knowledge, while the workshop-based intervention facilitated improvements approaching significance to overall health and health knowledge. Additionally, the workshop-based intervention facilitated a significant improvement to self-efficacy through to the post-intervention stage (eight weeks after the intervention conclusion). Qualitative feedback revealed examples of changes made by individuals that were significant within personally relevant domains. Promoting proactive coping amongst groups of older adults appears to be an effective strategy for facilitating efforts towards healthier ageing. A broad, proactive approach is a necessary counterpart to the specific, reactive approaches of most health promotion interventions for older adults.